Are you looking for stunning mountain scenery? Small town charm? Natural beauty? A float along the river? Friendly folks? Unique shops? Outdoor recreation? Then visit Narrows! We have it all! 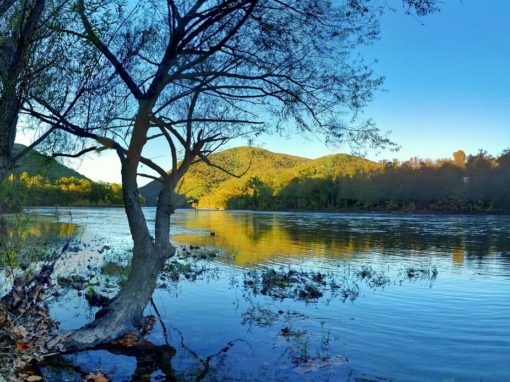 Narrows, settled around 1778, gets its name from the historic “narrows” point where the New River cuts through the ridges of East River and Peters Mountain. NARROWS TOWN PARK and Ragsdale Field are used for soccer, football and other sports. The town’s park, known as “The Boom,” has places for swimming, volleyball, basketball, playing games and picnicking. 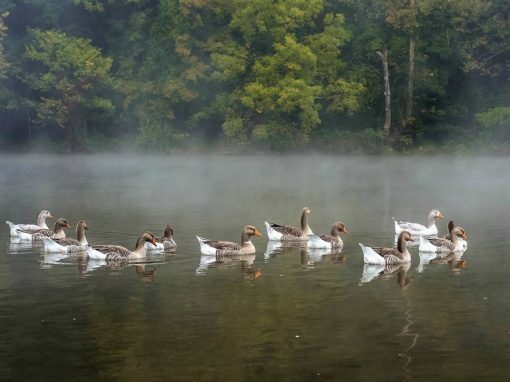 MILL POND is a popular place to enjoy ducks and Canadian geese. 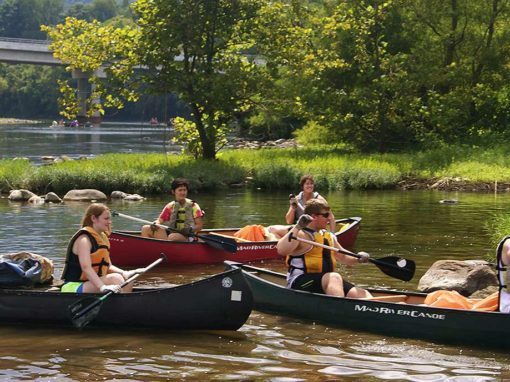 CAMP SUCCESS AND MILL CREEK NATURE PARK are also attractive Narrows amenities. Driving toward Narrows on Rt. 460, one travels beside the New River, which flows north into West Virginia. 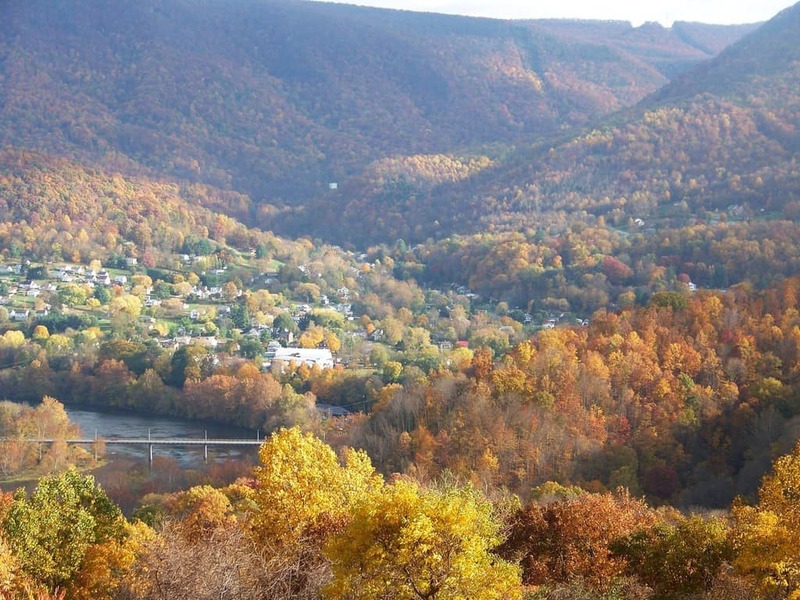 The Town of Narrows is named for the geological feature (“The Narrows”) where the New River is at its most narrow point between Peters and East River Mountains. The first settlers arrived in the area in 1778. 1. As you enter the town limits, turn onto Rt. 61 at the Rt. 460 stoplight. Follow Rt. 61 across the 11Randall W. Fletcher Memorial Bridge spanning the New River. The latest of three bridges that have been constructed here, this bridge was dedicated on November 23, 2013, and named for a local veteran who was a tireless contributor to the community. 2. At the end of the bridge, to the left is the 12 Norfolk and Western Depot. N&W came to Narrows in 1864 and locals still tell stories of riding the rails – especially on the renowned steam engine, J611. 3. Back on Rt. 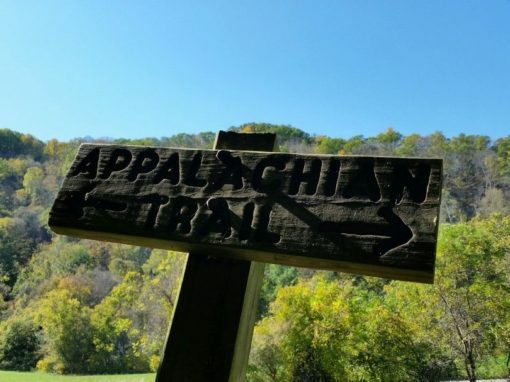 61, drive under the railroad overpass and turn right on Lurich Road for approximately .2 miles to 13 Camp Success, the locale of Civil War encampments. 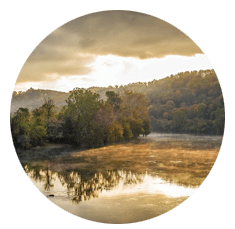 This 8.5 acre, primitive campground allows tent campers and picnickers to enjoy the beauty of both Wolf Creek and the New River. 4. Returning to the Rt. 61/Lurich Rd. intersection, turn right onto Rt. 61. The historic 14 MacArthur Inn is on the left. This structure opened in 1942 as the Hotel General MacArthur – the first U.S. building named for the World War II general. The building was used in many different ways over the years, but has been restored and operates again as an inn. 5. Past the Inn is 15 Anna’s Restaurant on the right. For over 20 years, Anna’s has served the area with delicious, country cooking and hosted the regular Thursday night Ole Time Music Jam. 6. 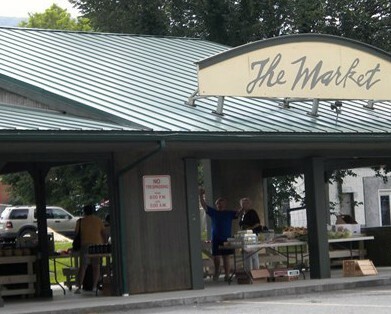 Across the street from Anna’s is 16 Centennial Park and “The Mural of Narrows”. The park was dedicated in honor of the town’s centennial in 2004. 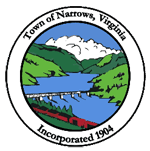 The mural, portraying “NARROWS va…NATURALLY!”, was added in 2013 by S. S. “Brick” Marunich, a Vietnam combat veteran, prolific artist, and Narrows resident. 7. Continue along Rt. 61 to its intersection with Kimberling to the 17 Veterans Memorial Park. 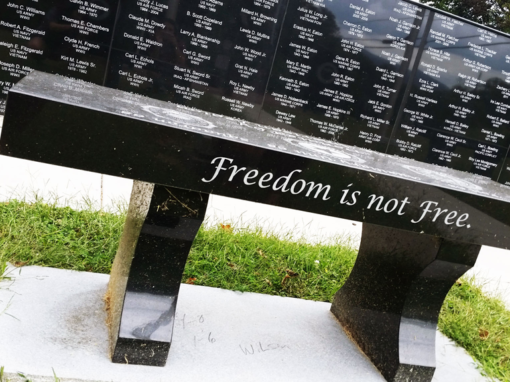 This important memorial was constructed by the local Veterans’ of Foreign Wars and many dedicated volunteers. It serves to honor all branches of service and allows quiet reflection on the sacrifice of our veterans. 8. Across from the Veterans Memorial is 18 Wolf Creek Mill Dam and Mill Pond better known as the Duck Pond. 9. Next on the left at the Mary Street intersection, sits the old Narrows High School building. The football field is still used, but today the building has been repurposed as the town’s 19 Community Center. The current high school is now located on the other side of the New River. 10. Return back along Rt. 61 East and turn right onto Main Street/Rt. 100 (across from Anna’s). On the right, across from the Post Office, is the home of 20 Right Turn, Clyde Brewing Company – a micro-brewery. 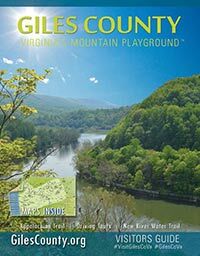 Next door to the brewery is Narrows Gift Shop and Art Gallery, a nonprofit retailer showcasing the talents of over 30 local artists, authors, artisans, and craftsmen. 11. Continuing up Main Street/Rt.100 approximately .3 miles, turn right on Northview Street. Follow Northview approximately 3 blocks, turn right onto College Street, then the next left on Poplar Street. Continue on Poplar Street for .8 miles to the stop sign and turn right on the gravel road (through the open gate) to the parking area for 21 Mill Creek Nature Park. 12. 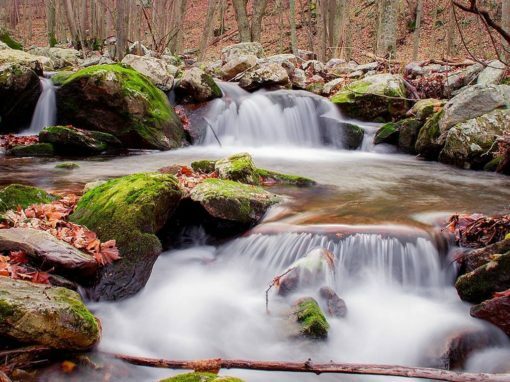 This 40-acre park adjoins the Jefferson National Forest and offers miles of trails for hiking and mountain biking. 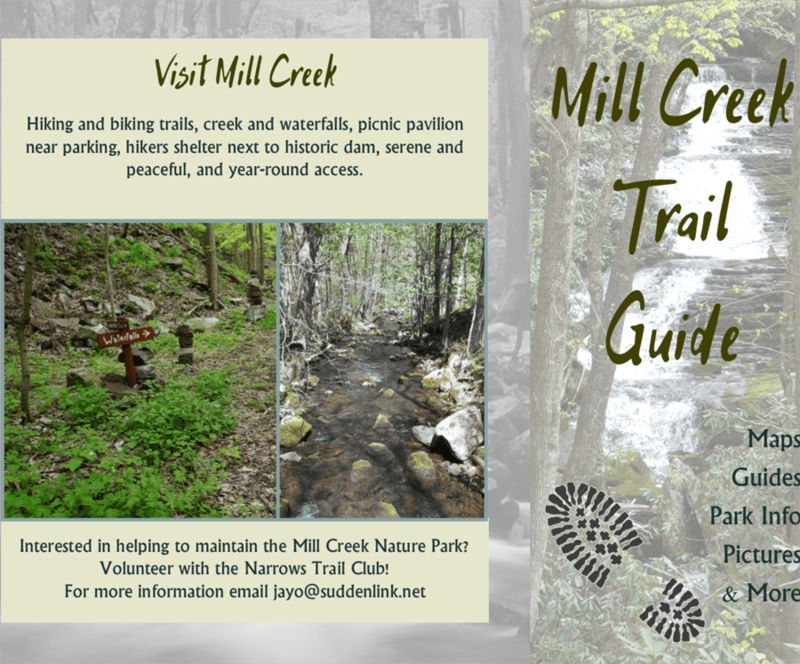 Hikers will find four Mill Creek waterfalls of varying sizes along the trails and fishermen can cast for native trout in this pristine water. An easy hike beside Mill Creek from the parking area brings one to the reservoir location where a section of the original stone dam from the late 1700s can still be seen. 13.Returning back to Main Street/Rt. 100 turn right, following the main original curving road (before Rt. 460 was built) toward the Town of Pearisburg through Bluff City. Or, take a left on Main Street, returning to Rt. 61, and cross the New River back to Route 460.